The greatest thing since the tennis ball has finally arrived! Daycare dogs are assigned to playgroups based on size and play style. Large indoor and outdoor play areas offer plenty of room to make new fur-friends, and human Pack Leaders provide constant supervision, safety, and love. When dogs don’t get enough exercise, they find their own ways to entertain themselves. They may invade your pantry, dig a tunnel through your couch, eat your underwear, or worse! Giving your dog enough exercise makes him happy, tired, and well-mannered, and it can save you from the total human meltdown that comes from arriving home to a disaster. Dogs are pack animals. They like interaction! Daycare gives your dog a chance to have fun with his four-legged pals while you’re off doing important human stuff. Well-socialized dogs are more likely to get along with other dogs and people, and you can feel comfortable taking them out or having company because you know they’ll behave. Even the best dog can have an accident if you ask him to hold it for too long. As your dog ages, it may become difficult for him to wait for you to get home for his potty break. Puppies need more frequent breaks as well (see our Puppy Playschool page), while their tiny systems work up toward being able to hold it for longer periods of time. Arranging for daycare on those long workdays (plus the monster commutes) means you can save your road rage for another time, because you don’t have to be in a frenzy to get home and let the dog out to potty. New puppy? Young puppies participate in Puppy Playschool from age 8 weeks to 16 weeks, where they receive extra supervision and special playgroups! Click here for rates and details! — All dogs must be up to date on the following vaccinations: Rabies, Distemper/Parvo, and Bordetella. We also highly recommend vaccinating against canine influenza. — Vaccinations must be administered by a licensed veterinarian and proof of vaccines must be provided prior to admittance to daycare. — Dogs are required to be spayed or neutered past the age of 8 months to participate in daycare. — We maintain a three strikes and you’re out rule for behavioral issues at daycare. Parents will be notified by pack leaders each time an incident occurs. 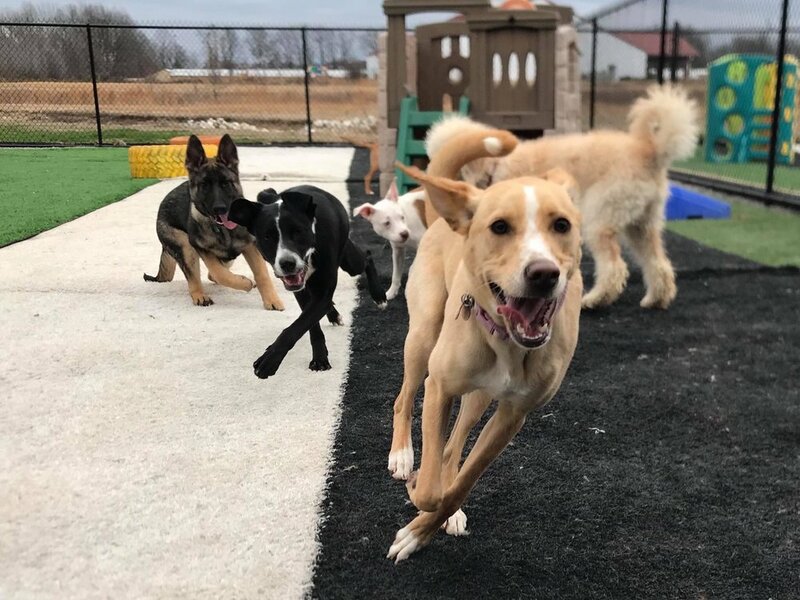 Depending on the severity of the incident, we reserve the right to expel a dog from daycare at any time for behavior that is not appropriate for off-leash playgroups. — Dogs are required to be up to date on flea and tick prevention. Flea/tick collars ARE allowed, however, they are considered a hazard and may get chewed off or damaged during the course of regular play. Hounds Hideaway is not responsible for replacing damaged or destroyed flea/tick collars. Congrats! Call us to make arrangements. We offer a modified Puppy Program for little ones that are not quite old enough or ready to participate in regular daycare. Socialization is critical for your young puppy, and daycare is THE best way to start him off on the right paw! What is the policy for half days? Due to the setup of our playgroups and lobby hours, half days are required to fall either during our morning hours (6:30a-11:30a) or our afternoon hours (2:30-6:30p). Yep. Most of the time, they are things that have nothing to do with us humans. A few examples: > Dogs playing together may nicely get carried away but still be poked or cut by a long nail or an accidental bite. > A playful puppy may get too far into another dog’s personal space, causing the older dog to snap back out of reaction (not aggression). > A pair of dogs might play chase and jump off a platform or toy and sprain an ankle. Click here to complete our New Client Registration Forms, and then you’re ready to schedule your dog’s first day! We ask that the dog be left with us for a Full Day on their first visit, in order to give us plenty of time to integrate them into the playgroups at whatever pace they are comfortable with. It is very important that this process not be rushed, so as to give your dog a great experience and first impression to pack play. This time also helps our Pack Leaders get to know your dog and determine which playgroups he will enjoy most. Think of it as a meet and greet! Advance bookings are required for the first day, and drop-offs are scheduled between 6:30am-9am Monday to Thursday. Once your dog is “in,” he can come anytime you like! Keep in mind that dogs who show aggression toward humans or other dogs will not be admitted to daycare. The safety of our people and your dogs are our highest priority!